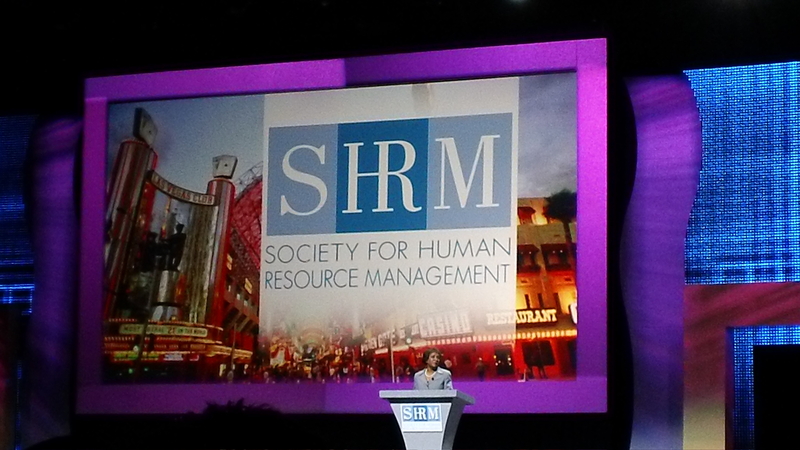 Last week, I had the opportunity to attend the SHRM (Society for Human Resources) Annual Conference in Las Vegas. I joined over 14,000 HR professionals from 73 countries, 1400 exhibitors, and 650 volunteers for the largest conference for HR in the world. I found out very quickly that these people like to have some serious fun. The exhibit hall was packed with magicians, games, iPad giveaways, product showcases, and more. There was even one company that hired a guy to play piano and sing classic Las Vegas tunes that included Sinatra and the Rat Pack. Even the keynote lineup was star-studded! I was bummed to miss Sir Richard Branson speak on the opening day due to airline delays, but was able to hear Arianna Huffington, Tony Hsieh and Michael J. Fox share their pearls of wisdom with the crowd. Oh, yeah. Forgot to mention that Keith Urban performed for nearly two hours one evening from the main stage! So, why am I telling you about this conference? Well, I wrote a nice little post a few weeks back titled Your Road Map to a Successful Conference. I took some of my own advice and walked the walk (literally – the Las Vegas Convention Center was a half-mile walk one-way from my hotel….in the 107 degree heat.) As a first time attendee, I found the conference to be very beneficial. The sessions were relevant and valuable, the networking was great, and I had some serious fun….all while continuing to develop myself personally and professionally. I even got to meet several people who I’d only know via social media up until then. It was so nice to put a face with the twitter name! 10 Ways to Stand Out from the Crowd: This session was focused largely on the topic of change and that “business as usual” isn’t enough anymore. The speaker challenged everyone in the audience to think about the value they bring to their organization. I left this session with a refocused on what I’m doing as a professional and how it relates to the bigger picture. The speaker also mentioned that you should renew your positive attitude. How does my attitude impact how others perceive, evaluate, work w/me, communicate & relate to me? Key takeaway: Don’t wait to react to change. Expect it and be proactive. Good words of advice. What are you doing in your career or job search regarding change? Rather than cram all the good stuff I learned last week into one VERY long blog post, I’m going to space it out over the next couple of weeks. I hope you find the information useful in your career and job search. A lot of the things I learned apply to just about anyone in any profession! Next week, I’ll highlight Tony Hsieh, CEO of Zappos.com and what I learned from his speech. Thanks for reading!